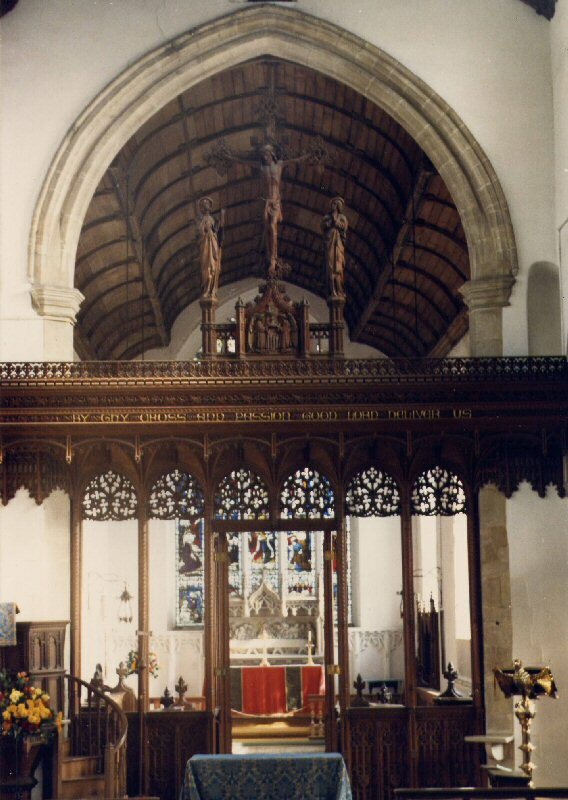 A trademark of George Fellowes Prynne’s work, most notably in the large churches of the Home Counties, is the massive stone screen, though he also designed screens in wood, and also metal. Here is an overview of his work. The Essex churches of St Mary the Virgin, Great Bardfield and St Mary the Virgin Stebbing are usually cited as being influential in Fellowes Prynne’s development of the stone screen. Both have massive mediaeval screens at the entrance to the chancel, elaborately decorated and with a central cross. The example at Stebbing has no figures, either on the cross or beside it, but that at Great Bardfield has the complete scene of Jesus on the cross, flanked by his Mother and St John. Both examples are sub divided into three sections, with the central section being wider than the outer divisions. This leads to a lancet arch feature either side of the central rood. See the postcard (left) of Great Bardfield church. Note that the screen does not spring from a chancel wall, but is based on the floor of the church. The screen at Stebbing (right) has a chancel wall either side of the pillars, although it is not known by the author if this feature is contemporary. Fellowes Prynne’s great stone screens are in general sub-divided into three sections, which may be equal, or else with the centre slightly wider, giving more scope in the central arches for rich tracery and decoration. Some contain figures, some do not even have a rood, but each is an individual work of art and craftsmanship worthy of attention. Click on the links below to the churches named to read about their particular stone screens. The screen at All Saints’ West Dulwich, London, now collapsed following a devastating fire, was the first of George Fellowes Prynne's stone screens. 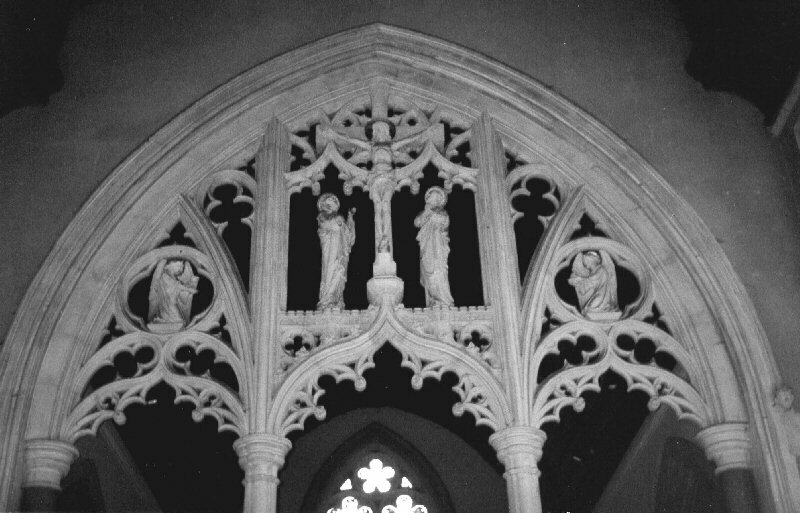 The screen was a composite, having rich stone tracery filling the expanse of the chancel arch, and below it, between central shafts and the sides, a set of iron cross members, the central one of which housed the rood and figures. The tracery of the stonework centred around three circles. The centre circle was divided into five segments, and the outer ones into four. Below them were three arches with cusp features decorating them. The central arch extended higher that the outer ones to meet the centre circle. The circles and arches were so designed that the space in the chancel arch was filled to the optimum extent, with very few ‘gaps’ to infill. The pillars sprung from a chancel wall, very much a feature integral to the screen, but in almost all cases constructed whether a screen was built or not. In Dulwich one observed the slenderness of the pillars, indicating that the nature of the screen was such that all the stresses and thrusts were borne correctly by the structure of the building and pillars. In this respect Fellowes Prynne had mastered the engineering competence of his mediaeval forbears. At St. Peter’s church, Staines, Middlesex, Fellowes Prynne designed what is probably his masterpiece of a stone screen. The Staines screen is divided into the usual three parts, in this case equal. It springs from a chancel wall, which itself bears an attractive wrought iron screen. The piers rise to identical arches with open trefoil tracery. The rood and figures are set on a level along the tops of these arches, each on a corbel. There are not only the usual three figures, but two angels on either side of the central figures. Unusually, the whole of the central unit, rood and tracery together, has been fashioned from one piece of stone. This can be seen as the architect’s plan by the way the points of the small arches above St. Mary and St. John merge upwards through the ends of the horizontal part of the cross to the top of the structure. As well as the mullion style tracery around the central figure, there are little bits and pieces of ornamentation filling the remaining spaces, chief of which is a pair of small circles with trefoils at the extreme sides of the screen. The screen at All Saints, Sydenham, London, like St. Peter's, Staines, has figures incorporated. Sydenham’s screen has other similarities with that of Staines in that springs from a stone and wrought iron chancel wall (complete with fine iron gates), and also in being of three equal sections with similar arches at the point where the tracery starts. The figures however, each occupy one complete third of the width (though the outer figures are inevitably enclosed by the chancel arch), and they stand on a horizontal stone beam. This, together with distinct vertical divisions, gives this screen a much more geometric appearance than, say, All Saints West Dulwich or Staines. The tracery incorporates trefoil and quatrefoil motifs, and is especially elaborate and thick-textured around the rood. At St. Nicholas, Taplow, Bucks the divisions are unequal, with the central division capped by a higher, more solid arch than those which flank it. The point of the arch becomes the base for the rood, and either side of this base is a small horizontal “platform” for the other two figures. To each side can be seen a circle within the lancet arch which extends upwards from the piers. In the circles are kneeling angels, and the remaining spaces contain the usual features of tracery. Unusually, this screen does not rise from a chancel wall, but is based on the floor, (similarly to that at Great Bardfield – see introduction to stone screens). There is a wrought iron screen at this level, however. A fine example of a stone screen by Fellowes Prynne can be found at Holy Trinity Church, Roehampton, Surrey. This is again different, both in style and content, from the other stone screens described. Rather than no figures at all, or the usual trio of figures in a rood group, there is simply an angel holding a scroll. There is a wrought iron cross, and decorations to the sides rather similar to those which were at All Saint West Dulwich, but no cross in the stonework. The three sections are almost equal in breadth. The only indication that the segments are unequal can be seen by comparing the distances between the fleur-de-lis motifs at the cusps of the tracery in the central arch and its two neighbours. The small discrepancy allows the designer to extend right to the top of the chancel arch the secondary arch structure in which the figure is housed. There are these secondary arches on either side also, but these simply contain a large encircled trefoil. There are smaller circles in the spaces between the secondary arches, and small cusps to make interesting the remaining spaces. 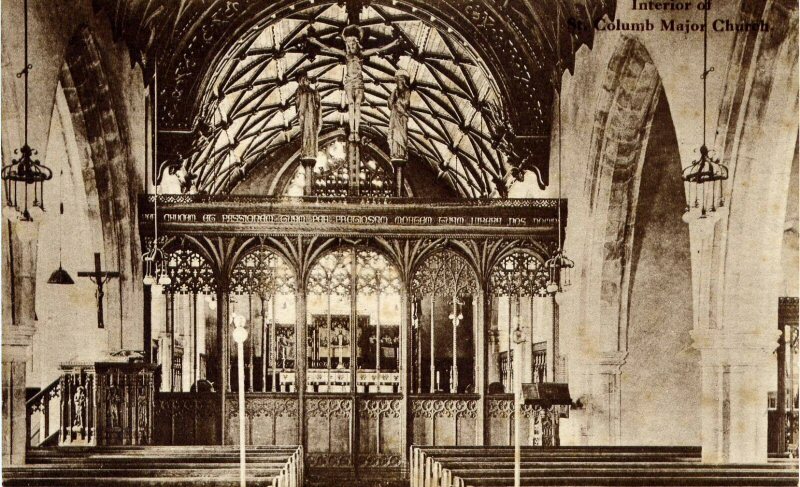 George Fellowes Prynne, being a West Countryman, was well acquainted with the ancient wooden rood screens of the village churches of Devon and Cornwall. He was often called upon to restore such artefacts, and in a number of cases, to replace them where they had been disposed of by a previous generation, or fallen into decay. Of the complete, new wooden screens designed by Fellowes Prynne, five are to be found in the west of England. The best example of his work restoring a screen is also to be found in the West Country. Away from the West Country, there are four examples of wooden screens newly designed by Fellowes Prynne. These are at Henley-on-Thames, Oxfordshire, at St. Bartholomew’s Hyde, Winchester, at Wargrave, Berkshire, and at Rattlesden in Suffolk. Click on the links below to the churches named to read about their particular wooden screens. Both above and below these layers can be seen delicate patterns giving the finishing touch to this part of the screen. The rood and figures are placed on top of the screen to which there is access via a stairway and door in the north wall. The screen, though not the rood group, was carved by H. H. Martyn and Co. of Cheltenham, who also did similar work for Fellowes Prynne at St. Cleer and St. Neot; some ladies of the parish carved the rood group. Further examples of west country churches with wooden screens by Fellowes Prynne are at Poundstock and South Tawton. At St. Mary, Henley, the screen follows the basic pattern of those in Cornwall. There are however some differences when compared with St. Columb Major, for example. 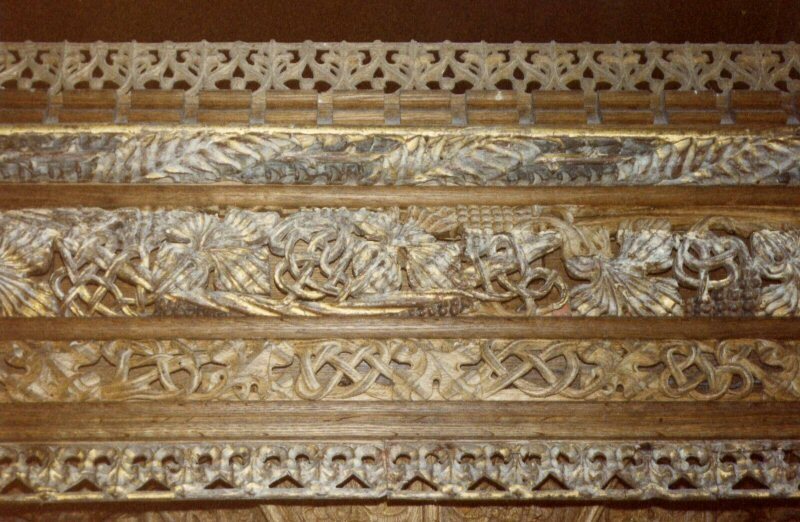 First of all the lower part of the screen, where the chancel wall would otherwise be, is not solid but has attractive filigree carving in panels across it. The mullions, dividing each side into two units do not become fan shaped at the top, and furthermore there is no sub-division of the lights of the screen. The in-filling tracery at the tops of the lights is much more freely structured than if it were dependent on sub-dividing mullions: the effect is of an arch shape made by the filigree work, as opposed to by the structure. It is an effective variant on the mediaeval concept. The horizontal carving is both luxuriant and at the same time delicate. The bands are much thicker than those at St. Columb Major, giving the structure considerable presence in a large building. The figures are located at the top of the screen in the traditional way, on a podium decorated in a manner complementary to the rest of the screen. The design includes memorial panel and clergy stall. The screen is particularly fine in the delicate design and detail of the tracery, and although substantial in size, it is designed so that the view to the sanctuary is not impeded. The craft work was carried out by Messrs. Dart and Francis at a cost to the parish of nearly £1000. Hyde is very much a village within the City of Winchester, and like many villages, it has an historic church. George Fellowes Prynne’s contribution to its legacy is his splendid oak rood screen, presented in 1908. It is more similar in appearance to St. Columb Major than to Henley, and has a text as at St. Columb Major, but the English version rather than the Latin. The tracery is considerably heavier in appearance than either of the two already described. Features of the carving and tracery are picked out in gilding, to give glorious opulence to the whole structure (see illustration). Furthermore the rood and figures of this screen are especially magnificent, with the scene depicted on either side of the podium on which the rood stands. One side shows two angels kneeling, with the chalice and host depicted above the IHS symbol for Christ’s name. On the east facing side, effectively the back of the screen, the detail is no less exquisite, with kneeling angels bearing a shield depicting the lamb and flag emblem. 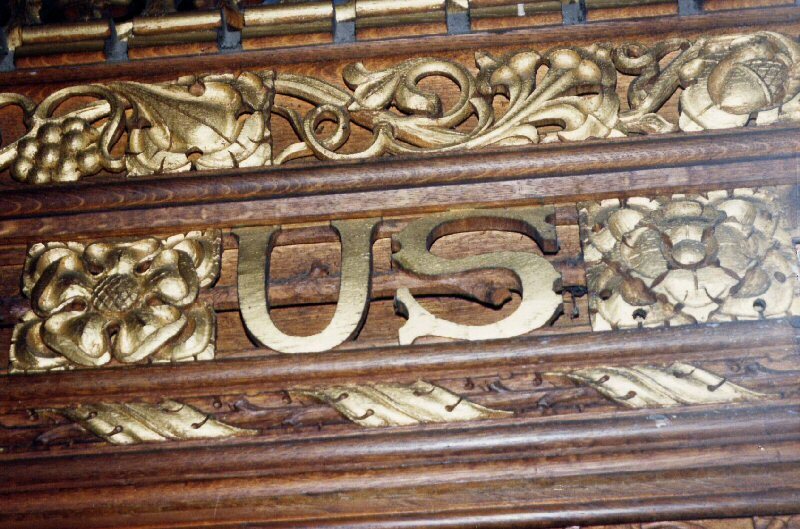 It should be noted that the text and gilding are executed to equal effect on the east-facing side of the screen as on the west. St. Mary, Wargrave was almost completely destroyed by fire, and it fell to Fellowes Prynne to design the rebuild. The job was completed in 1916, and one of the design features he used was a wooden screen. Pictures of the church before the fire show that here was no screen, though this does not of course mean that there never was one. There is an attractive simplicity about the new screen. The principal feature is the overhanging carved “pelmet”, which, if it were not so beautiful, one would be tempted to compare with the best Great Western Railway platform awning! It is this canopy effect that makes it so different, and, as it does not house a rood or figures, so very effective. There is a remarkable amount of “daylight” to be seen through the structure, despite its depth at the top. It is surmounted by a pattern so delicate that it is a tribute not only to the designer, but to the deft craftsmen, who too often fail to be given the credit they so deserve. In this case, it was the firm of A. Robinson of London SW1. St Nicholas, Rattlesden in Suffolk has what must be Fellowes Prynne's most important wooden screen. It is of oak, and is the complete assemblage of screen, Rood loft and Rood group. The base of the screen echoes a mediaeval fragment seen elsewhere in the church, and it contains carvings of the instruments of the Passion, as well as the “IHS” symbol for Christ's name, and the XP monogram. 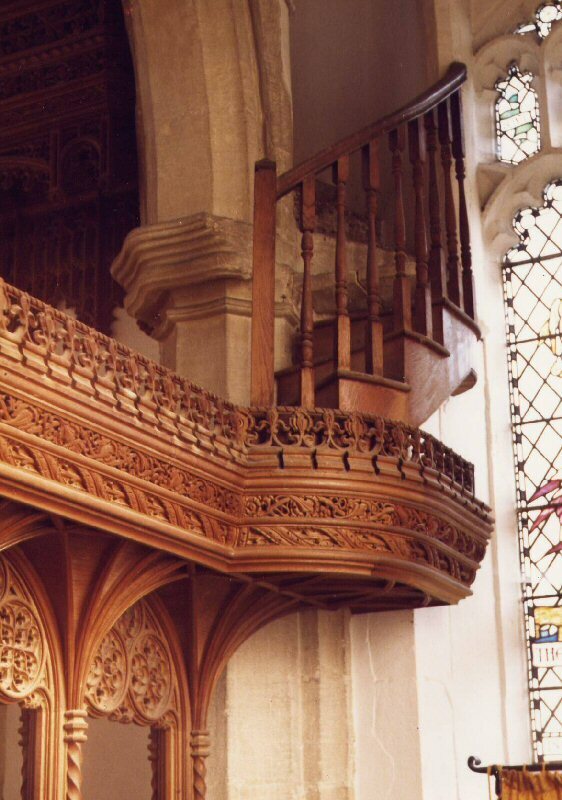 The most unusual feature of the whole piece is the access to the original staircase linking the top of the parclose screen (at the side of the Lady chapel) to the Rood loft. The top of the main screen, therefore, is accessible. The photograph shows the part of the parclose screen which houses the landing for the wooden and stone steps leading up to the main screen (which can be made out at the top left of the picture). This is a wonderful and unique piece of restoration; what a tragedy it would have been to leave the mediaeval steps in “mid-air” rather than, literally, restore them to their intended usage, as Fellowes Prynne had the foresight and insight to do. 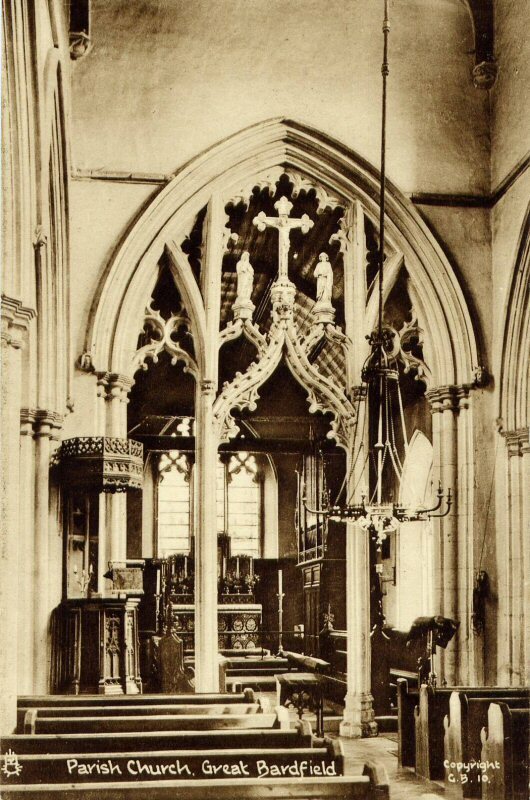 The postcard illustrated is undated and unused, but gives a particularly good view of how the light from the East window picks out the tracery in the Rood screen. Observation of the screen reveals much of the original fourteenth century carved and painted wood: the painted panels are located along the base of the screen, but they have each been framed by newly-placed carved wood, giving a unified wall effect. The paintings are to be found on the doors of the screen also. The main uprights are a mixture of original and replacement wood, though the tracery is all new. The fan vaulting supporting the main “roof” of the screen (which would have been accessed by a small stairway) is also new. The horizontal decoration, full of rich carving, is an amazing jigsaw of the old and new. Between new undecorated parallels can be seen intricate carvings of leaves, fruit and flowers. Parts of these are in the original painted wood, and parts are new, carved to exactly the same designs, and carefully placed among the original pieces to fit together as one. No attempt has been made to “age” the replacement wood, nor to paint over all of it to make it look the same. Clearly the screen does not look exactly as it did when first it was built; Prynne has added two top layers of decoration, as well as the plain horizontal members, which are possibly as much for structural rigidity as anything. What the screen does look like is a thing of beauty, in its correct context, which has been painstakingly saved from oblivion in the hands of a restorer and his craftspeople who patently cared for it. Prynne did not give the back of the screen such painstaking treatment - he completely renewed it. Whether this was on grounds of cost, or because this side of the screen was beyond repair is not known. He used different patterns from those on the front, and thus impressed a little more of his own originality on this magnificent artefact. The overall impression created by the interior of Buckland church is of an old church which retains its sense of the past, but with generally suitable and sensitive repairs and replacement. Wrought ironwork provides the material for a number of screens of different shapes and sizes. In many cases, the screen is situated on top of a stone chancel wall, giving added dimension to this feature, whether or not there is an associated stone screen. Integral to this kind of wrought iron screen is the pair of gates situated at the entrance to the chancel. There are good examples at St. Peter, Staines, St. Alban, Bournemouth, All Saints, Elland, St. Peter, Porthleven and St. Nicolas, Taplow. There are also wrought iron screens suspended between the piers of stone screens, as can be seen, among other places, at Holy Trinity, Roehampton. These screens are of fine, airy structure, and complement the stone screen, the chancel wall and the wrought iron screen on the chancel wall, all of which are weightier structures. He goes on to describe how the decorative work of the 13th century was the most perfect in terms of true simplicity and symbolical design. This description fails to comment on the overall appearance of the screen seen from further back in the nave. As has been said, there is the feel of a design for wood here, rather akin to the famous bridge at Ironbridge, which was designed along the principles for wooden structures, yet was built to that design – very successfully – in iron. This is not to doubt that Fellowes Prynne intended this screen to be metal; he was never one for compromise at any other time, so there is no reason to suppose that this screen looks any way other than how he intended. Not only does it have upright “mullions” which are solid and relatively undecorated, but its horizontal component is solid with small arch-shaped features and a decorative border, certainly unlike any wrought ironwork of the designer’s seen elsewhere. To complete the analogy with wooden structures, the two pairs of angels surmounting the screen to the left and right of the figures are almost identical in appearance to Fellowes Prynne’s “standard” angels found in so much of his work. “…modern metal screens were, for the most part, a lamentable failure”. He no doubt was confident that he had amended this state of affairs.